DAVIS, Calif. (KGO) -- Animals are known to have special talents but two puppies at UC Davis will be expected to pull off a much harder trick. 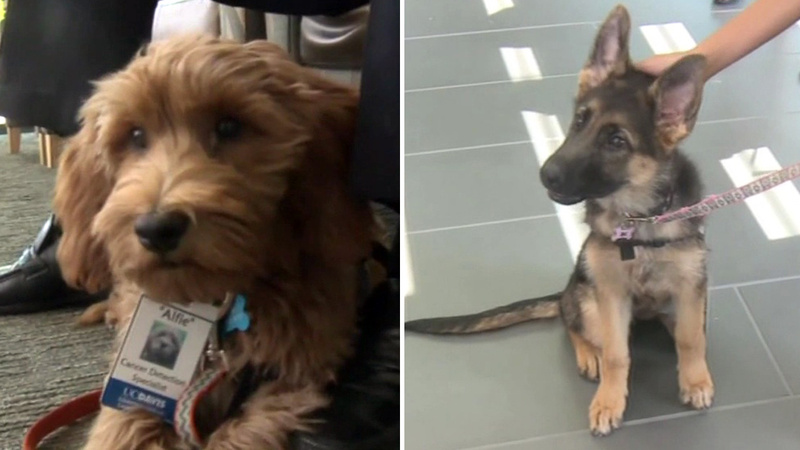 Alfie the Labradoodle and Charlie the German Shepherd will soon begin training to detect cancer. Researchers say Alfie and Charlie were hand selected for their focus and drive. Their job will be to train between four and six hours a day to develop their abilities to identify the scent of cancer. "The dogs are able to detect something, we don't know what it is, but they're able to identify blood --- from a patient with cancer versus a patient with no cancer," UC Davis Otolaryngology Chair Dr. Hilary Brodie said. When fully trained, Alfie and Charlie will be used for early detection of head and neck cancers. But Dr. Brodie is hopeful the eight legged team will be able to leave an even bigger paw-print on cancer research by helping researchers develop new technologies in the fight against cancer.